"...introduce students to ideation: the systematic process of generating design ideas, developing idea variations, and identifying ideas that open promising design directions..."
Having spent the previous week conducting research on design reinforced methods for behavioral change, our class came together this past week and spent several hours using affinity mapping methods to collectively organize and draw out inferences from our research. In my own studies I had focused pretty heavily on Fogg's Behavioral Model for Persuasive Design. BJ Fogg's Persuasive Tech Lab at Stanford has conducted some really interesting research over the past several years and provided some great literature to draw from when broadly researching technology driven behavioral change. 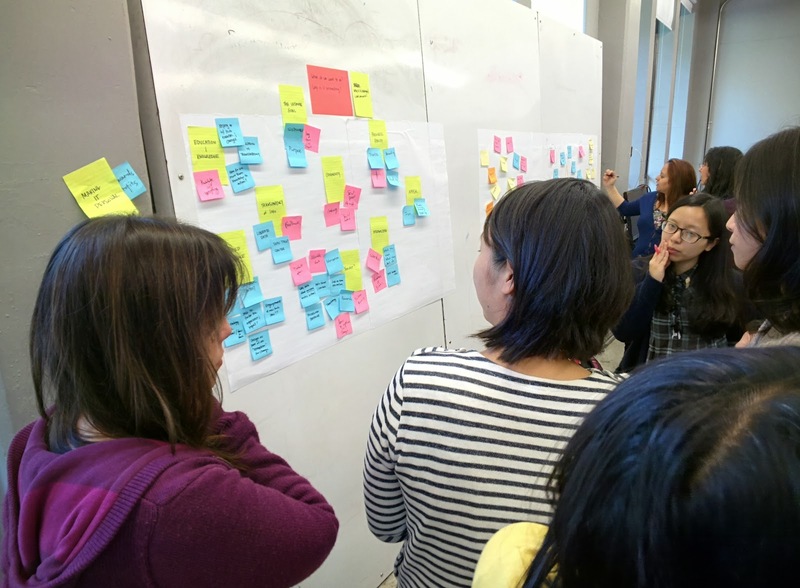 Of the group of thirty students, we broke apart into groups of four or five and each built our own affinity maps based on the relevant theories and literature we had studied. 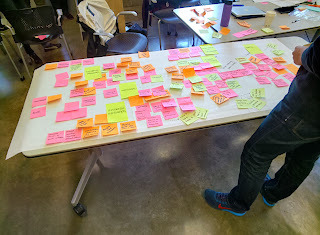 I thought the exercise went well, and when the groups came together after conducting their individual mappings we had a really excellent discussion that mapped out and connected together the classes research in some really interesting ways. Honestly, the ambiguity associated with the design process has been causing me a fair amount of anxiety. I'm used to a learning environment with a good amount of structure. That's where I feel really comfortable, and traditionally that's where I have excelled both academically and professionally. Having said that, a lot of the coursework I've taken over the past couple of years (computer science classes especially) deal very much in black & white solutions. Your code either works or it doesn't, its that simple. Sure there is an entire layer of optimizations and fine-tuning when talking about programmatic assignments, but generally you are very aware when you've completed an assignment. Compare that with an ideation exercise where everything is very ambiguous and there is no right or wrong answer, and that's where I'll start feeling a bit nervous. Admittedly, one of the big reasons I'm enrolled in an HCI graduate program is to learn how to work through that ambiguity. It's my sincere hope that as the year progresses, I'll become more comfortable thinking and working in a design-centric manner. For now though, I'll just take things one step at a time. Posted by Patrick Dugan on October 06, 2013 .